Having returned from the Abyss with Iomedae's blessing, you're ready to permanently close the Worldwound. Hosts of demons serving Deskari, the Lord of the Locust Host, await your challenge within the City of Locusts. 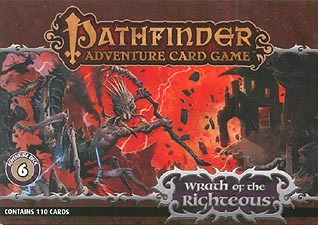 The Pathfinder Adventure Card Game: City of Locusts Adventure Deck is a 110-card expansion that adds new locations, monsters, villains, and more to the Pathfinder Adventure Card Game. This deck also includes rare loot cards and 6 new scenarios that make up the complete City of Locusts adventure, including an epic final boss battle. Complete your character's mythic ascension with the Pathfinder Adventure Card Game: City of Locusts Adventure Deck.